Congratulations to tour winner Danielle C. and to host winner The Avid Reader. 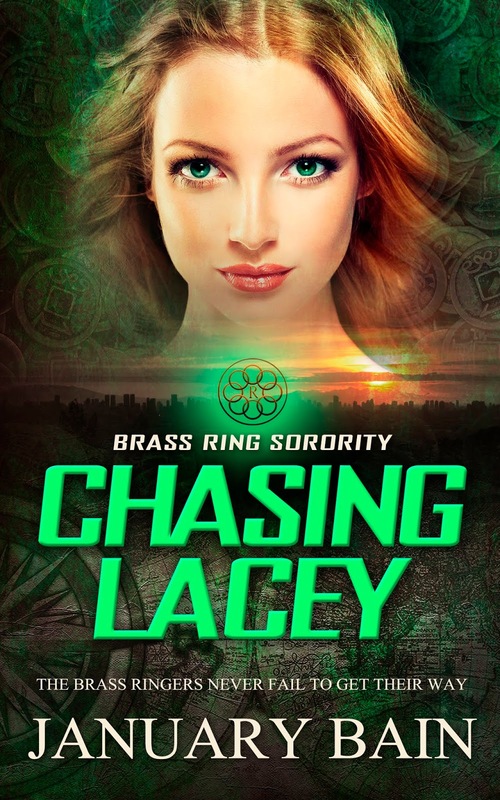 Goddess Fish Promotions is organizing a Virtual Blurb Blitz Tour for Chasing Lacey by January Bain, a contemporary romantic suspense available June 19th from Totally Bound. The tour will run June 18 - June 29, and this tour will not include interviews or guest blogs; however, a blurb, excerpt and author bio will be provided to every host for inclusion on their blog. A PDF, mobi, or epub copy of the book is available for review in conjunction with a promo post. January Bain will be awarding $25.00 via Paypal to a randomly drawn winner via rafflecopter during the tour, and a $20.00 via Paypal to a randomly drawn host. Think being a PI is all dull divorce cases? Think again. Lacey Cameron, private investigator and treasure hunter, takes being headstrong and passionate to a whole new level. It takes exactly one morning in a school teaching young minds for her and her identical twin sister to break the whiteboard pointer in half, throw their keys on the teacher’s desk, and heed the seductive call of wide open spaces and awesome adventures. William James Thornton III, a renaissance man and warrior poet who defended his country in Iraq and Afghanistan, knows he’s got his hands full trying to get Lacey to see him as more than just a friend. He’s ready to settle down, marry the woman of his dreams, and make his mother a happy grandmother. Hell, he’s got enough treasure in his bank account for two lifetimes. And then things go from normal craziness to extremely dangerous in a heartbeat as hired killers are sent after Will and Lacey to prevent them from discovering the truth. They stumble on such an unexpected twist to the story that no one in their right mind would believe it or have suspected. If Will can get them out of this mess, he vows to lay all his cards on the table with Lacey. Get her to recognize what they can share as a couple. Passion. Love. And a commitment to blending her wild nature with his own—the perfect spicy blend. Even if it looks like it might just be the death of him.